How Can You Carry More GCSEs from Your Home When You Need Supervised Coursework? Rear view of students with hands raised with a teacher in the classroom. Photo courtesy of Shutterstock. General Certification of Secondary Education (GCSE) is an academic qualification for a specific subject. Pupils of age 14-16 take this exam as secondary education in England, Wales and North Ireland. If you genuinely wish to improve your comprehensive resume and earning likely, gaining more GCSEs is the best way to do this. If however going to college is not on hand and you want to use home study or learning online courses to do this, how you do will get around the fact that GCSEs now involve that coursework must be done under exam conditions. This will not lend itself to learning online or home analyzes courses. Ready for success. Four college graduates standing in a row and smiling. Photo courtesy of Shutterstock. Is the United States Spending Enough Money on Education? Child in speech therapy. Photo courtesy of Shutterstock. CVs part of recruitment for international jobs. Photo courtesy of Shutterstock. Being the face that stands out from the crowd is not an enviable role for the average person. It is this fear of standing out in the open, exposed to danger, that keeps people from making a move that might have some high risks in the short term but big rewards in the long term. Young traveler outside of an airport. Photo courtesy of Shutterstock. How often do you think about what you want to do after college? Dream of being a stuntman? Professional crocodile wrestler? Politician? Whatever floats your boat, with college over, it’s time to face the big bad world head on. 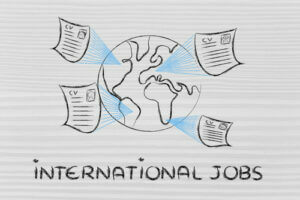 Should Money Be a Factor in College Recruiters Attracting International Students to Their Schools? While recruiting international students may be a goal at some colleges, should money be a factor in college recruiters attracting them? The following post has more on this recruiting strategy.